When you (as a main contractor or client) receive method statements you should evaluate them to ensure the contractor has complied with the contract requirements for method statements. Task/process and area of specialisation. The method statement should be used as a tool box talk/briefing with all those involved attending, the document should be written so that persons of all trades, and education can easily understand the document. If there are non-native language speakers then a translator should be used, often the method statement is translated using online translation software, however where the labour have no experience in the type of work especially if it contains even low risks then a suitable team needs to be selected for the works. The method statement should be signed as read and understood by all persons involved and copies filed in the site safety file as well as issued to all those that attended the briefing and have been issued with a copy of the method statement. 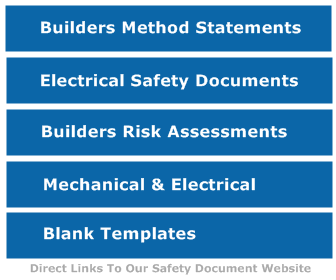 If the submitted method statement is poor and does not comply with your Health and Safety requirements then the contractor must re write and re submit. Method statements must be requested and supplied well in advance of the works commencing and NOT the day before or on the same day.